Somebody over at boingboing linked to a Sarah Palin Interview generator as a result of her recent interview. According to the site's creators: "The answers are computer generated based on probabilities calculated from Sarah Palin's actual speech." Q: What is your foreign policy experience? I think if you ask that question until somebody answers for me what is it exactly that the people of America are not fully satisfied with all the answers. It's going to be considered also. But again, it's got to put government and it's about putting government back on the verbiage that Senator McCain chose to use them. So we have opportunities for good in the war. You can't blink. You have to be allowed in their benefit, also, a mutually beneficial relationship for us all to be provided the hope that all Americans have, instilled in us, because we're a democratic, we are today with so much collapse on Wall Street, affecting Main Street. As best said by [former?] 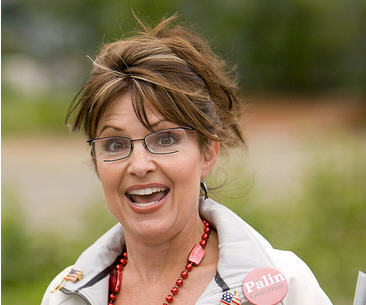 republican commenter on the boingboing post : "That being said, I can't even bear to listen to the word salad spewed by Palin any time she opens her mouth without a teleprompter. " Among independents, Palin saw her favorable ratings drop from 60 percent in early September to just 48 percent last week while her unfavorable ratings rose from 26 percent to 36 percent. If Biden can keep himself under control (and that's a big if), this coming VP debate is going to be a disaster for the Republicans. It crossed my mind that people who didn't watch or read the interviews might not have any context here, so here you go. Q: Why isn't it better, Gov. Palin, to spend $700 billion helping middle class families who are struggling with health care, housing, gas, and groceries, [to] allow them to spend more and put more money into the economy instead of helping these big financial institutions that played a role in creating this mess? "That's why I say I, like every American I'm speaking with, we're ill about this position that we have been put in. Where it is the taxpayers looking to bail out. But ultimately, what the bailout does is help those who are concerned about the health care reform that is needed to help shore up our economy. Um, helping, oh, it's got to be about job creation, too. Shoring up our economy, and getting it back on the right track. So health care reform and reducing taxes and reining in spending has got to accompany tax reductions, and tax relief for Americans, and trade -- we have got to see trade as opportunity, not as, uh, competitive, um, scary thing, but one in five jobs created in the trade sector today. We've got to look at that as more opportunity. All of those things under the umbrella of job creation." did you ever see that youtube video of the Miss America pageant? the one where the poor girl continued to repeat "I personally believe..." and talked about maps. Well, that's kinda what this reminds me of. Stephen - I did! Yeah... brutal. I kind of feel bad, but then, when one chooses to step onto the platform, this is the kind of scrutiny one should expect and be prepared to answer. So I don't feel too bad.